The Slow Readers Club is a band from Manchester, England, originally formed as Omerta in 2003. The members are Aaron Starkie on vocals, Kurtis Starkie on guitar, James Ryan on bass, and David Whitworth on drums. The band perform at the Reeperban Festival in Hamburg. 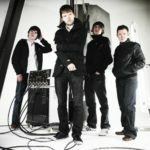 The band headline the Head For The Hills festival in Ramsbottom. The band play the Beautiful Days Festival in Escot Park, Devon. The band plays the final date of their Build A Tower tour at The Sugarmill, Stoke. The band plays at Islington Assembly Rooms in London. The band plays at Northwich Library. The band plays at Wolverhampton Slade Rooms. The band play their biggest headline show to date at Nottingham’s Rock City. The band play live at The Welly in Hull. The band play live at Riverside in Newcastle. The band play a 45-minute set at The Stag & Dagger Festival in Glasgow. The band play live at Sound City in Liverpool. The band play live at Manchester Cathedral. The band play live at Brudenell Social Club in Leeds. The band play live at Southampton Engine Rooms. The band start their Build A Tower tour at the Cardiff Globe.